Active listings of homes in the Lawrence Metropolitan Area totaled 245 at the end of February, representing a 2.0 months' supply, up from a 1.8 months' supply in February 2018. During February, 104 contracts for homes were written, 11.1 percent lower than the same month in 2018. 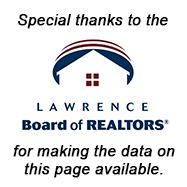 The number of contracts pending for homes in the Lawrence Metropolitan Area at the end of February was 135.